I grow cilantro every year, but mainly for seeds to collect. Roasted and milled cilantro seeds are known as coriander spice. And, believe me, if you would only try freshly made coriander spice, you would never buy one at the store again. My mind was blown away by rich and nutty aroma of homemade coriander. It makes a great pairing with fish, meat and some vegetables. To be honest, I’m not a huge fan of cilantro. There are a couple of recipes that I really like, though. I would even say that without cilantro in them, those dishes will be much more dull and boring. 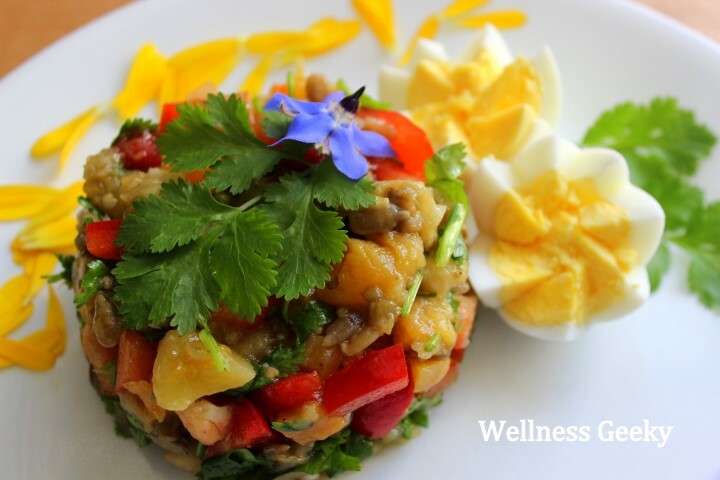 This cilantro eggplant salad recipe is one of them. Preheat oven to 350F. Wash eggplant, cut lengthwise, put on a oven-safe tray. 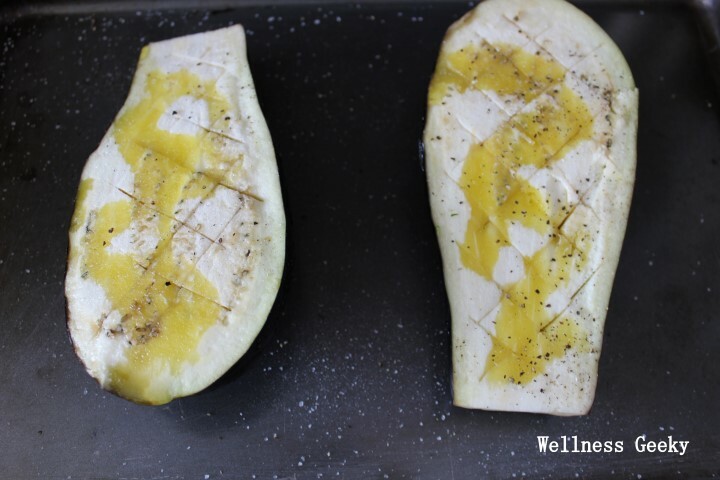 Make cuts on eggplant with a knife in a crisscross pattern. Sprinkle with salt, pepper and olive oil. Cover with aluminum foil or silicone mat and bake for 20 minutes. Let the eggplant to cool down, then scoop out the inner flash with a spoon, and chop into small cubes. To make a salad chop all ingredients, add salt and pepper to taste, and dress with olive oil. Salad can be kept in the fridge up to 3 days. Eggplant can be baked night before too. It pairs nicely with hard-boiled eggs, ground meats and breads. Enjoy this healthy and colorful salad. And what is your favorite dish with cilantro?